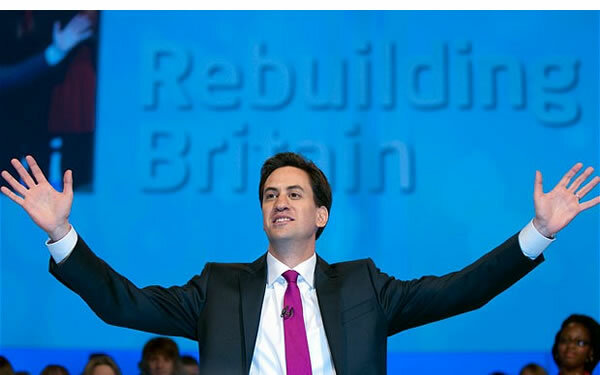 But no-one should be confused by Miliband's 'One Nation' theme. Despite the audacious lauding of Disraeli, this was no lurch to the right. It was a bold claim that true British patriotism is social democratic: informed by the compassionate and co-operative values of the NHS, hostile to profiteering big business, egalitarian, and committed to the strengthening of 'our common life'. Claiming that all of these are manifestations of the 'spirit of the British people', Miliband was making an unashamed appeal to Conservative voters. But it was an appeal not to come to Labour because the party has moved to the right - Blair's pitch - but to come to Labour because its values are actually yours too. At just the moment when David Cameron has allowed his original 'detoxified' brand of moderate-sounding conservatism to be drowned out by the shrill free marketeering of his party's extreme wing, it is a compelling call. The speech has achieved the conference's primary purpose - Miliband by common consent (including that of the Tory commentators) now looks credible as an alternative Prime Minister. While not trying to deny his own wonkishness (he didn't quite say 'I grew up in a household of refugees from Nazi Germany having debates about "predistribution"', but to his aides' dismay he couldn't resist telling Andrew Marr that he rather liked the word) but the accusation of weirdness has been put to bed, and his general bearing of relaxed confidence has been widely remarked upon. But the speech merely gives him the media's permission to address voters as a serious alternative to David Cameron - it didn't in itself tell them much about what he would do with power. Indeed Labour's Conference as a whole merely highlighted the fact that the party now confronts two almost completely different tasks. The first, clearly, is to win. Labour will go into the next election needing to gain 75 seats for a majority, recapturing voters who deserted it for both the Lib Dems and the Tories in 2010. As every constituency delegate MP kept repeating in Manchester, reflecting their experiences on the doorstep, this remains an uphill task. Labour still has to overcome a huge amount of distrust - not just of itself, but of politics and politicians in general: what Jim Murphy, at an IPPR / Political Quarterly fringe meeting, described as the 'militant apathy' of the electorate. It has to convince people that it is credible on the economy again, overcoming people's belief (right or wrong) that Labour failed last time. Most of all it has to speak in a language that resonates with the daily struggle of the 'squeezed middle' - to make ends meet, to find a job and to buy a home. Labour's second task is to develop solutions to the profound crises of capitalism and society which it will face if it gets into Government in 2015. It has become clear for some time that the financial system is no longer serving the real economy, and needs major reform. But the weaknesses of the British economy as global economic power shifts away from Europe and the US is much deeper than that. As the report published by the Resolution Foundation last month shows, the UK economy as currently structured is no longer capable of raising the living standards of the majority of British people. Based on analysis by the Institute of Fiscal Studies and the Institute for Employment Research, the report shows that even if the UK economy returns to growth (in itself a very big if), the rewards will go entirely to the top half of the income distribution, with living standards for the bottom half continuing to fall. At the same time the ageing of the British population is generating a huge strain on our systems of social protection - in the pension system, the NHS, and in social care for the elderly. The marketisation of public service by this Government is hollowing out the very institutions and values which will be needed to meet such social challenges. And meanwhile the global crisis of the environment - of rapidly accelerating climate change, of resource price volatility and food and water insecurity - threatens to undermine the entire model of economic growth on which global markets depend. This is a formidable set of challenges for a government to address - a much, much more difficult set than those faced by Blair and Brown in 1997. At first sight these two tasks - to win, and to develop answers for these profound challenges of modern society - look as if they are almost entirely separate from one another. Labour could successfully appeal to its target voters without developing complex policy solutions in areas such as industrial and innovation policy, tax and public service delivery reforms, and global environmental co-operation. And having any number of the latter is not going to give them victory. Yet in fact bringing these two tasks together is Labour's most vital challenge. Not because it cannot win without deep policy thinking; but because it won't be a successful government without it. Unless Labour goes into the next election clear about the kind of radical reforms it will need, it won't be committed in government to implementing them. We know that from 1997 - a limited vision before an election constrains ambition after it. That means rejecting those who will seek to make Labour a 'small target' in 2015, committed only to a small number of electorally safe headline policies. It means finding ways to explain to voters just how profound are the difficulties faced by the British economy and society, and the kinds of policy reforms which will be needed. And it means trusting that the British public, however immediate their daily concerns, at some deeper level do understand this. This is not going to be easy. The solutions required will take Labour into previously uncharted territory. Yet what was encouraging about Labour's conference was the extent to which these issues were being debated on the fringe. The fact that some of those making the arguments were Ed Miliband's closest colleagues and advisers must be regarded as an added bonus.